My attention was grabbed by an article in the Guardian (reproduced here) which featured a whole slew of names showing their latest eco-friendly and/or fair trade designs on the catwalk this week. You could be excused for getting the impression that the whole British fashion scene has gone ethical (it hasn't) but nevertheless the breadth of designers showing their ethical fashions is truly encouraging. Whether in a "eco-collective" such as the Conscious Designers Collective (it would be rude to suggest that London Fashion Week designers by nature spend most of their time unconscious) or Esthetica (a London based sustainable fashion initiative) or a snazzy underwear producer "Pants to Poverty" or ultimate recycled fashion in the shape of Junky Styling, there's clearly a lot going on. In amidst all this, Defra (no not a fashion label, it stands for Deparment For Environment, Food and Rural Affairs, but you knew that didn't you?) launched its new Sustainable Clothing Action Plan. "The Sustainable Clothing Roadmap has brought together over 300 organisations, from high street retailers, to designers and textile manufacturers to battle the environmental impacts of 'throw away fashion'. Companies and some of the biggest names in fashion have signed up to take actions to make a significant difference to the environmental footprint and social inequalities which blight some of the production and retail processes of consumer fashion." Ethical brands - getting the word out, or keeping things close to the chest? We've been contacted by a UK University student union anxious to make sure that their student societies are armed with the information they need to make ethical choices on tshirt printing and other promotional clothing. They already read the ethical profiles in our blog and find them useful in the decision making process, with different societies having differing needs. However they've made us aware that some of the unanswered questions that we raise leave them a little nervous about certain suppliers and they have even done a little investigating themselves to try and get to answers. In the case of Fruit of the Loom, they contacted the company to ask about getting a copy of their Ethical Policy and were told that they don't hand it out to customers. With Fruit of the Loom exercising their right to silence, and the unanswered question against them in our original article further investigation was thought appropriate. What has become clear is that their new giant production plant (based at Skhirat, Morocco) is still under construction. When it is complete the facility (producing fabric from raw cotton) should be the biggest of its kind in Africa. The issue for the University Union is whether the company can now be trusted to be ethical or not. To recap, Fruit of the Loom got bad publicity because of its dismissal of union officials in Morocco in 2000/2001. That was before the company was taken over by Berkshire Hathaway. Since then there has been apparently no similar bad publicity connected with its operations. The vertically integrated company means that Fruit of the Loom should be able to keep control over working conditions all along the supply chain - with the exception of the raw cotton production which is out of their hands. Even if Fruit of the Loom keep their cards close to their chest, one thing we thought one could expect from a Berkshire Hathaway company would be close adherence to the laws of the countries in which they operate and their own "Code of Business Conduct and Ethics". An issue in 2001 was that local government was strongly anti union and may have permitted Fruit of the Loom to act in contravention of Moroccan law and their requirement to comply with International Labour Conventions that it had ratified. The new plant is in a different location, and Fruit of the Loom should be expected to act to different standards now. Even if we are not sure explicitly what those standards are, the lack of bad publicity is good news. At the same time, unions in Morocco are actively pressurising the government to enforce a new labour code put in place in 2005 - however, it seems from this article from 2007, local governments are often flouting the code. But at least there is a new code and the signs are (although I can't be sure) that the 2000/2001 issues would not have arisen under this new code. One has to contrast the lack of communication of Fruit of the Loom with the relative openness of Gildan. Both these vertically integrated compies have had union problems in overseas countries in the past. However Gildan have worked quite publicly with outside groups to move on. Under the skin there may be little difference in how individual employees are treated, but we just don't know. We continue to trace Pier32 printed tshirts to far flung parts of the planet and here we see them being worn by volunteers from the UK charity Platform2 which as best illustrated through its website MyPlatform2.com is responsible for sending adventurous volunteers to Ghana, South Africa, Peru, India or Malawi to help aid or relief operation. Unlike some other aid programmes, it's aimed at people who wouldn't otherwise get the chance to volunteer abroad, so it's fully-funded and free for the volunteer. Platform2 is fully funded by the UK Government's Department for International Development (DFID) and is run by a consortium of charities, Christian Aid, Islamic Relief and BUNAC. One of the important features of Platform2 is that the volunteers are asked to relate the benefits and experiences of their trip in their community - through music, art, film, photography - whatever the volunteer may be into. Here is a video of Platform2 volunteers sporting their Pier 32 tshirts going from Glasgow to Aberdeen to promote Platform 2 to young people in another part of Scotland. 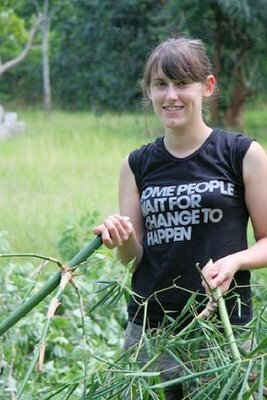 The tshirts, which carry the simple but cutting slogan "Some people wait for change to happen", often get worn by volunteers in the field but are especially intended to help promote Platform2 in the UK. One is given to every volunteer at their initial briefing day and they take them to the country they travel to. When they come back, they attend a 3-day residential course where they discuss and are given ideas on how they're going to express their experiences of working in countries where poverty is so widespread and what they're going to do to promote Platform2. When they promote the scheme, they always wear their t-shirts. We think it's all in all a great concept and are proud that we can supply ethically sound products that work so well to support Platform2 both in the UK and abroad. The city of York has a thriving art scene - our client Special Day Films had the excellent idea that it needs something of a collective badge for this talent to wear and promote both art and York (and especially art in York!) to inspire more people from all backgrounds to get involved in exercising their creative side. The I "heart" York t-shirt, printed on fair trade clothing supplied by Starworld of Africa, was perfect for their needs. The pricing hit the spot, yes, but very importantly for the artistic community, the fact that the t-shirts are fairly traded, Starworld being accredited by WRAP (Worldwide Responsible Accredited Production), means that the artists wearing the shirts can make a bigger statement that extends beyond the boundaries of York. 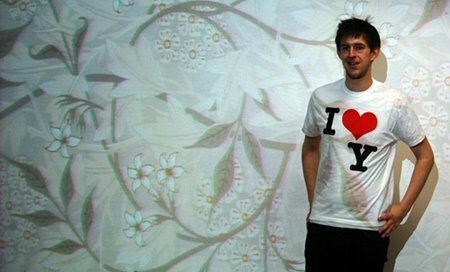 In the image above the artist Ian Parkin makes his statement. While the concept is in its infancy, a website is already there to show off some of the talent and allow the people of York to grab a t-shirt and be part of the action.